As a verb (in our usage): to ask or to invite; as a noun: a message. 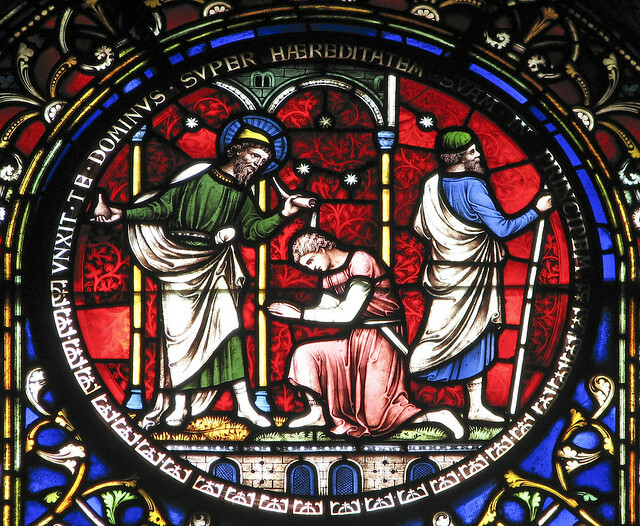 In our last Rotation Samuel anointed David, signifying David’s “calling” as Israel’s next king. We didn’t identify it as a calling per say, but sure enough, it was one. It was also a message from God to David. The Bible doesn’t tell us but we can imagine that David and his family were surprised at this invitation. As equally surprised as the fishermen that Jesus invited — called — to be his disciples; a lot of years later. As I said, moving from one call to another! Our next calling story is about Jesus calling his disciples. Read about it in Matthew 4:18-22, 9:9 and in Mark 3:13-19. Join us at FUMC our Cool Disciples experience Rotation Model Christian education, as they learn about Bible stories and concepts through kid-friendly multimedia workshops. This is where the “Schedule” used to appear — which grades were visiting which workshops over the course of this Rotation. However it was removed as it was sort of out of date 🙂 Our current schedule of workshops, for whatever Rotation we are currently on, can be found on this page. In the Cooking Workshop students will make (and eat!) “fish-shaped” pizza to recall the significance of fishing in the calling of the disciples. In the Storytelling Workshop students will hear congregation member share their story of being “called” to follow Jesus. They’ll learn that “calling” takes many forms! In the Art Workshop students will use the Japanese process of Gyotaku – fish printing – to open discussion of Jesus calling disciples. View the slideshow of completed prints! In the Video Workshop students will watch portions of the live-action video The Visual Bible: Matthew and play a game to spark discussion about ways we are disciples of Jesus. View a growing list of opportunities to foster faith learning at home for this story. The Calling of Peter and Andrew by James Tissot, in the Public Domain, via Wikimedia Commons. 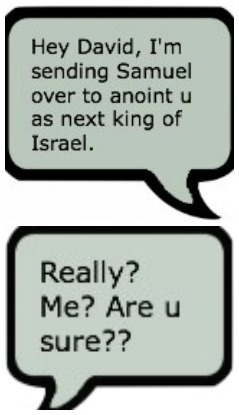 Text message created from speech bubbles also in the Public Domain, via wpclipart.com. I’m a summer kind of gal… kicked-back, long days, sunshine, and gardening! Yes, please! So fall is not my favorite time of year. But there is one thing that I do find appealing about fall: the return to a full program of the Rotation Model! A Bible story is explored and learned in-depth through a variety of creative teaching mediums (workshops) over a period of several weeks. Each new workshop visited deepens kids lesson memory. Kids from age 3 to 6th grade, whether attending Sunday’s downtown or Saturday’s at Green Wood, are all focusing on the same story, which allows families to share learning at home. To kick off, we are studying about how a lowly shepherd-boy, David, was chosen by God to be the King of Israel. The prophet Samuel anointed David with oil (shown below). Why did God choose him as king?? Read about our story in 1 Samuel 16:1-13. And come along with us as we begin our year of Rotation! for this month’s story :: click here. In the Art Workshop students will create modern “name” art based on the style of artist Paul Klee. Contemplate your inner character as you work! In the Cooking Workshop two teams of students will make muffins with two different recipes. One has something special in it and one does not! Students will note that both look the same in a raw state. I wonder about the baked muffins? In the Creative Writing Workshop students will create an acrostic poem using the word “heart” and describe their inner character. What attitudes are in your heart? In the Bible Skills & Games Workshop students will participate in a variety of games – voting with your body, a game of “Spoons,” and a quiz game that involves collecting “heart” qualities (graffiti-style). If you are in the area please join us for the fun learning at First United Methodist Church in Ann Arbor, MI. Stained glass of David’s anointing by Lawrence OP, who licensed this photo on Flickr under a Creative Commons License.